We know Universal’s patented Frankenstein Monster for his tabletop skull, the dusty black suit, clubfoot boots and, of course, those neck bolts, ostensible electrodes, as if The Monster ran on AC/DC. Boris Karloff had a name for them. On November 20, 1957, Karloff appeared on This Is Your Life, a hugely popular show where host Ralph Edwards literally ambushed an unsuspecting celebrity on live TV, parading out acquaintances and family members, and piecing together a superficial biography of his surprised guest. Karloff was dismayed at first, but he played along like the good sport he was, eventually warming up to the proceedings. One of the show’s best moments came when makeup man Jack Pierce showed up. You can see the genuine fondness Boris and Jack had for each other, with Karloff calling his friend “the best makeup man in the world!”. When Jack Pierce comes out, he hands Karloff a souvenir, one of The Monster’s electrodes. Karloff playfully holds it up to his neck and says, “I used to call it the Alemite cup”. The Alemite company, founded in 1916, manufactures grease guns, pumps and oil mist systems for the lubrication industry. Among related accessories are a number of pins, couplings and fittings that could very well stand in for The Monster’s neck bolts. Three of these are shown in the photograph above. The first one is a brass-colored Alemite fitting with locking cross pins that any Monster would wear with pride. The second item is a valved pressure cup that provides lubrication while bearings are in motion. It’s an Alemite cup, but too fancy a design for our purposes. The third one, though, is a good match. It’s an Alemite grease cup, very similar, with its flat, flanged end, to The Monster’s iconic neck ornament. In the early days, Karloff worked a variety of side jobs, supplementing his meager income as a stage actor. On This Is Your Life, he mentions a stint in a building materials yard. 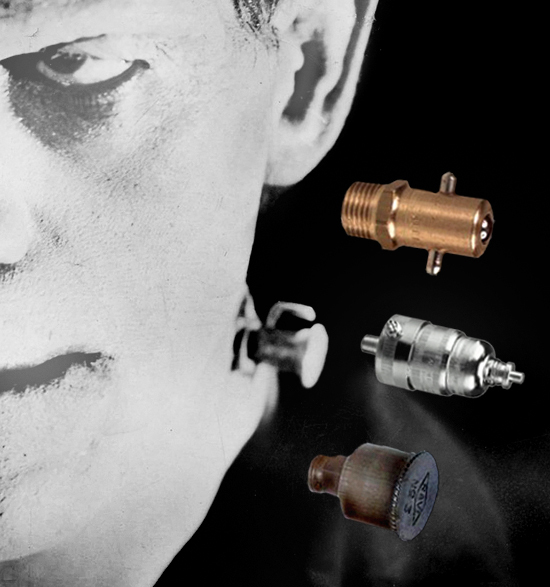 There, or in any number of odd jobs held through the Twenties, Karloff could have handled the Alemite products he’d come to associate, jokingly, with The Monster’s neck bolts. What a delightful clip. Thanks for posting. "Oh Pierre, you've done it again!" God bless actors who have worked with their collars blue, as well as stained with greasepaint! Wonderful. Thank you so much !!! This was a great clip. Love karloff.